> > percentage of a load is this for a 36 up a 4%? > knows will tell us both. The steel flats will be a bit heavier than the box cars and gons. We don't know if there is anything in the box cars, but it wouldn't be anything too heavy. Wood cars average 12 tons empty, plus one ton "adjustment factor" per car and for sake of simplicity, we end up with about 15 tons per car. 15 X 12 is 180 tons. A 480 is good for 232 tons up the hill. 180 is a abit over 3/4's of 232. So......the answer is about 3/4 of capacity. 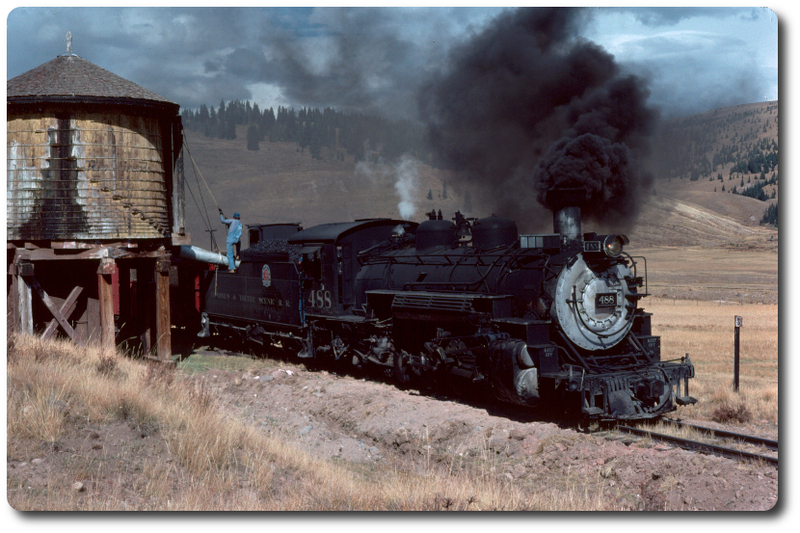 Back when we ran the boxcar coaches every day, our standard train out of Chama was 12 cars - 180 tons. The tonnage rating had been reduced to a longevity-enhancing 210 tons. We thought we worked the engines hard enough. We thought we were big time when they would hang a 13th car on the train and we "slugged" it out with 195 tons! Today's trains run from 200-230 tons depending on how many 30-ton coaches are in the train.